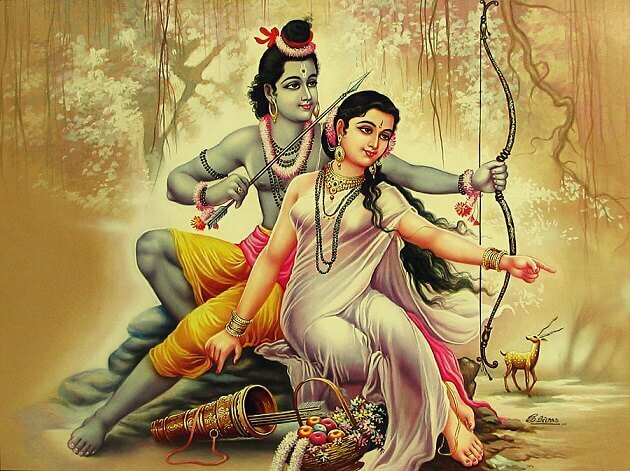 The condition was that maa Sita will marry to that person who pulled and break lord Shiva’s bow. All the kings tried, but they could not move the bow. When the turn of Shri Ram came, Shri Ram lifted the bow with the same hand and tried to drag wire like this that the bow broke into two pieces. 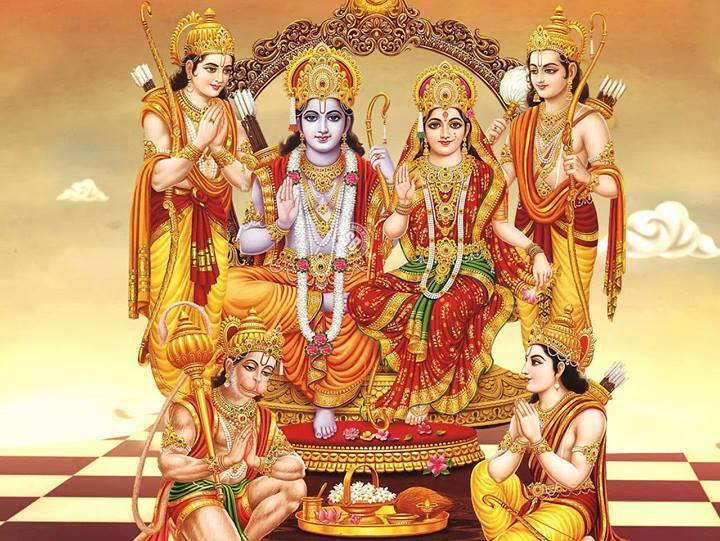 Thus, there is a union of Shri Ram and maa Sita. King Dashrath of Ayodhya had three wives and four sons. Lord Ram was elder in all the brothers and his mother's name was Kaushalya. Bharat Raja was the son of Kekayi, the second and beloved wife of Dasharatha. There were two other brothers, Laxman and Satrughan whose mother's name was Sumitra.When lord Ram was preparing to make Raj Tilak on one side, his stepmother Kaikeyi was plotting to make his son Bharat a king of Ayodhya. This conspiracy was done by the old manhandra. Rani Kekayi once had protected the life of King Dashrath, then King Dasaratha had asked him to ask for anything but Kekayi said, I will demand the time when it comes. On the strength of the same verse, Kekayi asked for the throne of Ayodhya for Raja Dasaratha's son Bharat and fourteen years of exile for Ram. lord Ram was obedient and therefore he blessed his stepmother Kekaii and left the state to spend fourteen years in exile with mother Sita and dear brother Lakshman.Raja Dasharath could not bear this infinite sadness and he died. When Kaikeyi's son Bharat came to know about this, he too refused to take the throne. 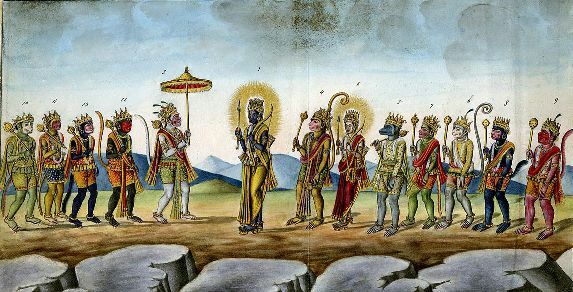 Fourteen Years of Exile of Ram, Sita, and Lakshman left for exile. On the way, they killed many evils and met with many holy and good people. They started making a hut in forest painting. 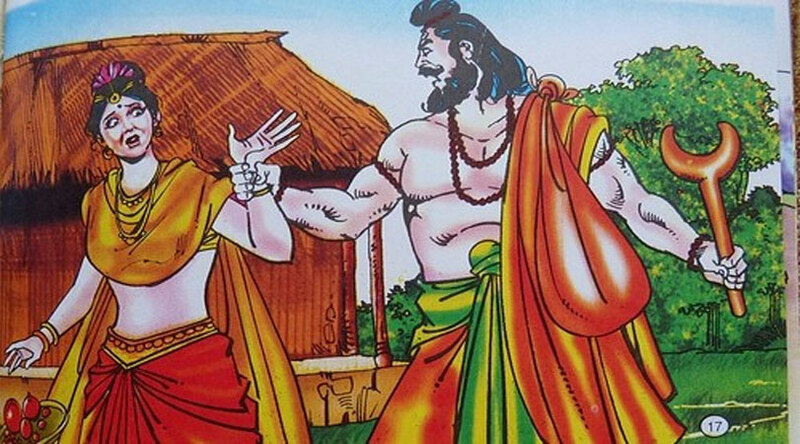 It is a matter of time that the youngest sister of Lanka, Raavan's youngest sister, Sourpankha, saw Rama and she was fascinated.He tried to get Rama but Ram replied - I am married, look at my brother Lakshman, asking him. Then Swaroopkhan went to Lakshman and offered marriage proposal, but Laxman refused to accept it. Then Swapanka got angry and attacked Maa Sita. Seeing this Laxman cut the nose with a knife. When we were crying with a cut nose, when we reached Soorpankha Lanka, Ravana got very angry after knowing all the things. After that, Raavan made plans for Sita Harna. Under the plan, Ravana sent the Maricha monks to Chitrakoot's cottage as a beautiful deer. When Mata Sita saw Marich, she asked Shri Ram to bring that deer to the gur. After accepting the matter of Sita, Ram went behind him after catching that deer and ordered Laxman to leave Sita and not go anywhere. 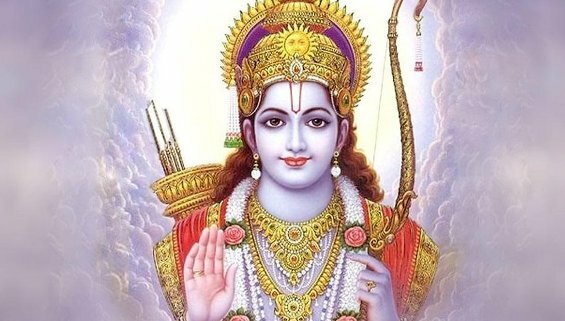 After much pitch, lord Ram hit that deer with arrows. As soon as Rama's arrow became deer, Marich came in his real monster form and started calling for the help of Sita and Laxman in the voice of Ram. When Sita saw the monstrous moan in Ram's voice, she got nervous and asked Lakshman to go to the forest to help Ram. Lakshman secured Sita's cottage from "Laxman Line" from all fours and he went to the forest to search for Shri Rama. According to the plan, Ravana reached the cottage as a monk and started the voice of Bhiksham Dehi. As soon as Ravan got his feet on the Lakshman line near the cottage, his feet started burning, Ravan asked Mata Sita to come out and give food. As soon as Mother Sita left the Lakshman Rekha, Ravana kidnapped her in a Pushpak plane.When lord Ram and Lakshman know that they have been deceived, then they did not get any of the cottages and ran there. When Ravana was taking Sita to a Pushpak plane, the old Jatayu bird fought to rescue Sita from Ravan, but Ravana cut the wings of Jatayu. When Shri Ram and Lakshman were going out of Sita, Jatayu's body was lying on the way and shri Ram were mourning. When Rama and Lakshman asked him about Sita, Jatayu told them that Ravan had taken Sita from the mother and told him that he died and that he died. Hanuman was the Minister of the Vanar Sarkar of King Sugriva of Kissininda. shri Ram and lord Hanuman first met at Rishikukh Mountains where Sugriva and his companions lived. Sugriva's brother Bali also snatched her state from her and kept her wife in custody.When Sugriva got to Ram, they both became friends. When Ravana was taking Sita mother to Pushpak plane, Mother Sita gave her alarms for a sign, she found some apes from the army of Sugriva. When he showed it to Shri Ram, he tears in the eyes of Ram and Lakshman. Shri Rama slaughtered Bali and made Sugriva king of Kisindha again. Sugriva also played a friendship, pledged to Ram that he and his ancestral army would also take the entire life of life to relieve Sita's mother from the clutches of Ravana. After this, lord Hanuman, Sugriva, Jamwant, together, led the Agar army of the Sugriva and sent their forces in four directions. After finding all the directions, but most of the army returned when nothing was found. On the south, Hanuman took an army led by Angad. When he reached the shore of the South, he was also sad and was talking about it on the Vindhy Mountains.There was a big bird sitting in the corner, which was named Sampati. Sampati was very happy to see the apes and started thanking God for giving so much food. When all the apes came to know that he was about to try to eat them, everyone began to criticize him and took the name of the great bird Jatayu and began to tell the story of his bravery. As soon as Jaya's death came to light, he started crying loudly. He told the Vanar Sena that he is Jatayu's brother and also told that he and Jatayu together in heaven had defeated Indra even in the war. He also told that while protecting Jatayu from the sun's rays, all his wings were burnt and he fell to that mountain.Sampati told the ancestors that he has gone to many places and also told that the Asur king of Lanka Ravana has kidnapped Sita, and on the other side of the same southern seas is his kingdom. Jamwant, while giving attention to all the powers of Hanuman, said that Hanuman is you the master of knowledge, the lord of the apes and the son of the Pawan. Hanuman's heart became joyful when he heard this and he spoke to all the people at the beach along with all the tubers that you originally eat, and waiting for me to wait till I return to see Sita's mother. By saying this, they flew over the sea and went towards Lanka.On his way, he first came to Maneka Mountains. He asked Hanuman to rest for some time but Hanuman replied - As long as I did not complete the work of Shri Ram Ji, there was no place for rest in my life and they went ahead while flying.Gods sent Hanuman's mother to Suras to take examinations. Suras tried to eat Hanuman but he could not eat Hanuman. Hanuman went out in his face and came out again and went further.Taking a shadow in the sea, he used to be monstrous eating. 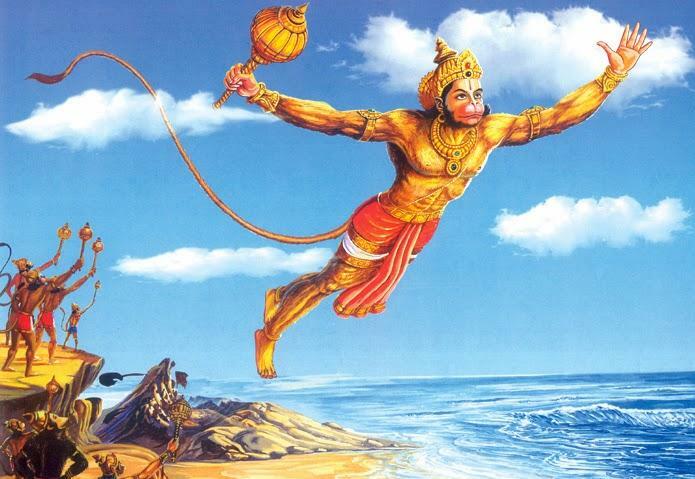 He caught lord Hanuman, but Hanuman killed him too. After reaching the beach, Hanuman climbed up a mountain and from there he saw Lanka. The state of Lanka showed them to which there was a large door and the whole of Lanka was made of gold.Hanuman shaped the shape of a small fish and started going inside the door. At the same gate lived a monstrous named Lankni. When he stopped the path of Hanuman, Hanuman gave a loud cry and went down and went down. He added Hanuman to his fear and allowed him to go inside Lanka.Hanuman searched mother Sita everywhere in the castle but she could not find him. After finding a little later, he saw a palace in which a small shrine was also a basil plant. Hanuman Ji was surprised to see this and he had a desire to know who is the person who is the devotee of Shri Ram. To know this, Hanuman embraced the form of a Brahmin and called him. 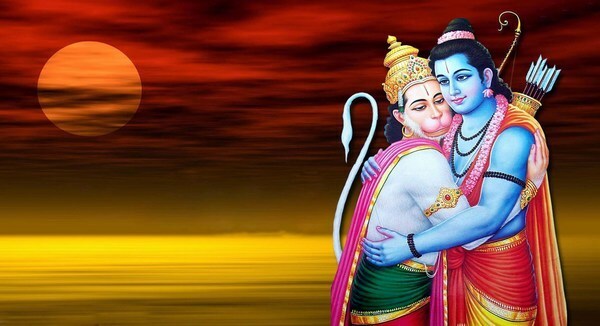 Vibhishan went out of his palace and when he saw Hanuman, he said, "O great man, seeing me, I find great pleasure in my heart, do you own Shri Ram?" Hanuman asks who are you? Vibhishan replied - I am Ravana's brother Vibhishan.Hearing this, Hanuman went to his real form and told him all things about Mr. Ramchandra. Vibhishan requested: - O Pawan, once me, join Shri Ram. Hanuman replied - Surely I will introduce to Shri Ram Ji, but first let me tell you how can I get to Janki's mother? Hanuman Sita visit in Ashok Bhatika. HANUMAN MEET MATA SITA AT ASHOK VATIKA - Vibhishan told Hanuman that Ravana had imprisoned Sita Mata in Ashok Bhatika. After learning this, Hanuman Ji took a small look and reached Ashok Vatika. After reaching there, he saw that Ravana accompanied his tens at the same time in Ashok Bhatika and used Sita Mata to distribute the price of fine to see him, but even then Sita did not even look at her once. Ravana asked all the monks to scare Sita. But a monstrous named Trigata called for help and care of Mother Sita and scared other monks so that all other monks also took care of Sita.After some time, Hanuman placed the ring of Shri Ram in front of Sita Ji. Seeing the ring ringed by Shri Ram, happiness came out of the eyes of Sita's mother. But Sita Mata was skeptical whether she had any tricks of Ravana. Then Sita's mother cried out who was carrying this ring. After that Hanuman Ji appeared but seeing Hanuman Ji did not believe Sita Mata. Afterward, Hanuman Ji described Ramchandra's qualities with sweet words and told that he is the messenger of Shri Ram Ji. Sita asked the rage of Shri Ram Ji with distraction. Hanuman Ji replied - O mother, Shri Ram is fine and they miss you a lot. They will be able to get you soon and will send your message to Shri Ram soon.Then Hanuman asked Sita from the mother to show a sign to see him, then Mother Sita lifted her bracelet from Hanuman. Now it was a matter of concern for the army of Shri Rama and Vanar how the whole army could go to the other side of the ocean. Sri Ram Ji requested the sea to give way that their army could cross the sea. 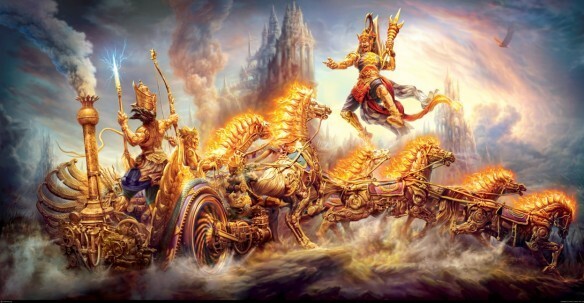 But even though the sea did not listen to them, the sea did not listen to them, then Ram demanded a bow of Lakshman and the fire bowed on the ocean, from which the water could get relief and they could move forward. As soon as Shri Ram did this, the sea god appeared scared and apologized to Shri Rama and said, "O Nath, do not do that, with this arrow, all the fish and living creatures living in me will end. Shri Ram said, 'O sea god tell us how my vast army can overcome this sea. The sea God replied - O Raghunandan Ram There are two apes in your army: Tap and Neel can swim in any of the big things in water by touching them. By saying this, the sea god went away.According to his advice, Nal and Neel wrote the name of Shri Ram on the stone and saw the bank in the ocean, and the stones swam. After that, the Nail Neel after throwing stones into the ocean in the ocean and then reached the other end of the sea. 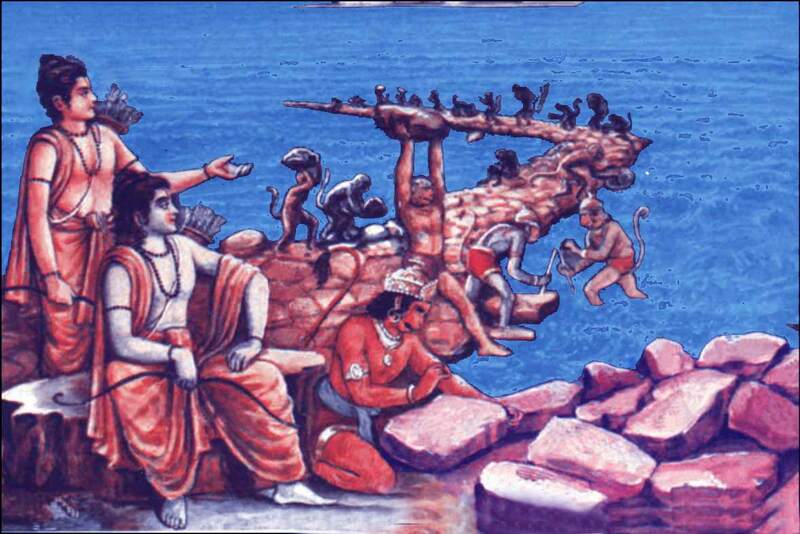 Sri Ram's Apara army in Lanka SRI RAMA MONKEY ARMY AT LANKA Shri Ram camped along the seacoast with his army. When it was revealed to Rao's wife, Mandodari, he was nervous and he explained Ravana very much but he did not understand and went to the meeting. Ravana's brother Vibhishan also explained Ravana in the meeting and asked Sita to give him directions to shri Rama, but listening to this, Ravana got angry and kicked his own brother, due to which the civilization came down from the staircases. Vibhishan left his state and went to Shri Ram.Ram also gladly accepted him and gave him the place of residence in his tent.For the last time, Shri Ram sent the son of Bali to Angad Kumar but Ravan did not even accept it. There was a fierce battle between the army of Shri Ram and Ravana. In this war, on the Lakshman Meghnad struck with power binding, due to which Hanuman Ji went to the Himalaya Mountains to take Sanjeevani Buti. But they could not trace that plant, so they had just picked up the entire Himalaya Mountains. In this war, the army of Shri Rama of Ravan's army is present and in the end, lord Ram shoots him in Ravana's navel and kills him and Sita brings the mother back.Sri Ram makes Vibhishan the king of Lanka. With the help of Shri Ram Mata Sita and Bhai Lakshman, they return from their 14 years of exile. Just as every person who comes into the world comes before it is fixed in his birth date before his birth. In the same way, the incarnations of Lord who were born in human form also had a fixed time on this earth, after the time of their death, they had to return their people after abolishing death. We have till now all Lord Krishna and God Laxman's death or yoose has told the story of his departure.Today we will know how Lord Shri Ram left this person and went back to lord Vishnu. The greatest obstacle to the death of Lord Rama was his beloved devotee Hanuman. Because, because of Hanuman, Yama did not have so much courage that he had reached Ram. But solve it by Shri Ram himself. Let's know how Lord Ram solved this problem.One day, Ram knew that it was time to die. He knew that the one who takes birth has to die. "Let Yama come to me. Vaikuntha for me, it's time to go to my heavenly home, "he said. But the god of death, Yama, was afraid to enter Ayodhya because he feared the supreme devotee of Ram and Hanuman, the main guard of his palace. For the entry of Yama, it was necessary to remove Hanuman. Therefore, Ram dropped his ring from a hole in the palace floor and asked Hanuman to find it and bring it. Hanuman made himself shaped like a whirlpool, and just entered the hole to find that ring; that hole was not only a hole, but a tunnel was the way that went to snake town snake people. Hanuman met King Vasuki of the Nagas and told him the reason for his arrival.Vasuki Hanuman took the middle of the Naga where a ring of rings was stacked! "Here you will find the ring of Ram," Vasuki said. Hanuman was thinking about how he could find him because he was like finding the needle in the straw. But fortunately, the first ring they raised was Ram's ring. Surprisingly, the second ring that he picked was also the ring of lord Ram. In fact, all the rings that were in that heap were all same. "What does this mean?" He got into thinking. Vasuki smiled and said, "The world we live in, we go through a cycle of creation and destruction. Every creation cycle of this world is called a Kalpa. Every era has four eras or four parts. In the second part or Treta era, Ram is born in Ayodhya. An apron follows this ring and receives Ram's death on earth. Therefore it is a pile of hundreds of thousands of artifacts. All rings are real. The rings continued to grow and their piles grew bigger. There is a lot of place for the rings of future rams too. "Hanuman knew that there was no accidental occurrence of his entry into the Cobra and the mountains of the rings. It was Ram's way of explaining to him that death could not be prevented from coming. Lord Ram will get death. The world will end. But as always, the world is rebuilt and Ram will be born again.